“I’ve never been so happy doing dishes,” Ivy Longie says, and then she starts laughing. Then crying. And then there is hugging. Then more hugging. 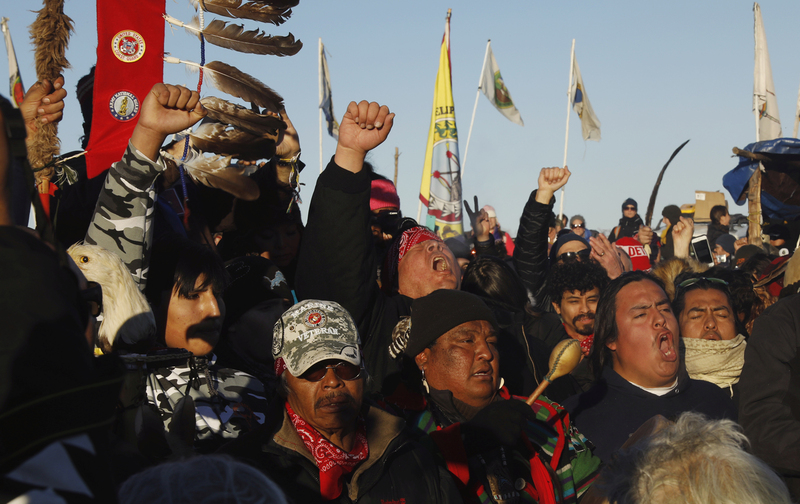 Less than two hours earlier, news came that the Army Corps of Engineers had turned down the permit for the Dakota Access Pipeline to be built under the Missouri River. The company will have to find an alternate route and undergo a lengthy environmental assessment. Ever since, the network of camps now housing thousands of water protectors has been in the throes of (cautious) celebration and giving thanks, from cheers to processions to round dances. Here, at the family home of Standing Rock Tribal Councilman Cody Two Bears, friends and family members who have been at the center of the struggle are starting to gather for a more private celebration. Which is why the dishes must be done. And the soup must be cooked. And the Facetime calls must be made to stalwart supporters, from Gasland filmmaker Josh Fox to environmental icon Erin Brockovich. And the Facebook live videos must, of course, be made. Hawaii Congresswoman Tulsi Gabbard—here as part of a delegation of thousands of anti-pipeline veterans—is on her way over. (“Exhilarated,” is how she says she feels when she arrives.) CNN must, of course, be watched, which to the amazement of everyone here gives full credit to the water protectors (while calling them “protesters”). The climate movement already knew that mass organizing could get results. We learned it, most recently, in the Keystone XL fight and the resistance to Shell’s Arctic drilling. Victories usually come incrementally, however, and at some delay after mass action. Standing Rock is different. This time the movement was still out on the land in massive numbers when the news came down. The line between resistance and results is bright and undeniable. That kind of victory is rare precisely because it’s contagious, because it shows people everywhere that organizing and resistance are not futile. And as Donald Trump moves closer and closer to the White House, that message is very important indeed. The youngest person here is someone many people credit with starting this remarkable movement: 13-year-old Tokata Iron Eyes, a fiercely grounded yet playful water-warrior who joined with her friends to spread the word about the threat the pipeline posed to their water. When I asked her how she felt about the breaking news she replied, “Like I got my future back”—and then we both broke down in tears. Everyone here is aware that the fight is not over. The company will challenge the decision. Trump will try to reverse it. “The legal path is not yet clear, and the need to put financial pressure on the banks invested in the pipeline is more crucial than ever,” says Chase Iron Eyes, Standing Rock Sioux Tribe attorney and member (and a recent congressional candidate). Listen to Naomi Klein on the Start Making Sense podcast.